A DNA match on Ancestry.com was the key to finding out about a previously unknown branch of the family, and a fourth cousin just down the road! The connections go all the way back to the Eket farm in Marbäck parish, Jönköping, Sweden. Johannes Månsson, my 3x-great-grandfather, was the first of my ancestors to own the Eket farm. He moved there in 1835 with his wife Maria Christina Månsdotter and children. Here is a chart showing the children in the center, Johannes’ ancestry on left and Maria Christina’s ancestry on the right. This chart shows one of those funny things that happens all the time in Swedish ancestry: the kids in the center of the diagram had a paternal grandfather named Måns Persson and maternal grandfather named Måns Persson – two different people with the same name living in the same parish. Swedish genealogy is not for the faint of heart. 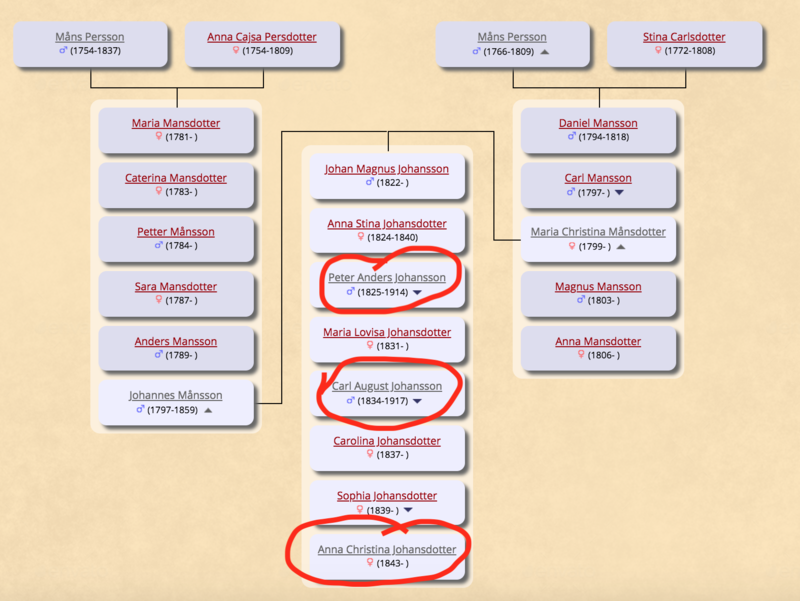 Anyway, the connections I came across are between Peter Anders Johansson (my great-great-grandfather), his brother Carl and his sister Anna Christina. Peter Anders Johansson eventually inherited Eket and stayed there throughout his life. Peter Anders’ younger brother Carl August Johansson was the first of this family to move to America. In America, he was known as Carl Rudeen, the first person in our family (as far as we know) to use the Rudeen surname. Carl first settled in Altona, Illinois with his wife and two daughters. I surmise that the Illinois Central Railroad may have paid for his passage to America in exchange for a couple of years of employment. I knew little about the baby sister, Anna Christina, until this week. I had seen her name in the Household Examination Records, and had seen her mentioned in the estate papers of her father Johannes. The estate inventory referred to her as “Anna Stina” which a lovely nickname. I had never traced Anna Stina in the Household Examination Records beyond the year 1851, when she was only eight years old. She would have been sixteen at the time she was mentioned in the estate inventory. Well, it was a descendant of Anna Stina who turned up as a DNA match on Ancestry. Thankfully, the descendant has her family tree posted online, make it easy to figure out the connection. Now for the rest of Anna Stina’s story! She too came to America. She came to America in 1869 at the age of 26. Shortly after her arrival, she married Gustaf Stark, a fellow Swede who came from Säby, a parish not too far north of Marbäck. Though I don’t know, I’d guess they knew each other back home. We find Gustaf and Anna Stina in Altona, Illinois in the 1870 census – right next door (next entry down) to Uncle Carl! I’ve studied this record a dozen times and never knew this family was connected to ours. This record is even more intriguing due to the neighbor on the other side. Uncle Carl’s last name is badly mangled and his name is shown as “Charles Rhodins”. There is a “Frank Rhodins” family also next door (entry above) to Uncle Carl. I have no idea who this family is but surely they are related. This is moving to the top of my research list. Gustaf and Anna Stark stayed in Illinois, spending their lives in Monmouth, just forty miles down the road from Altona. They had seven children. My DNA match is descended from one of their sons, John Elias Stark. 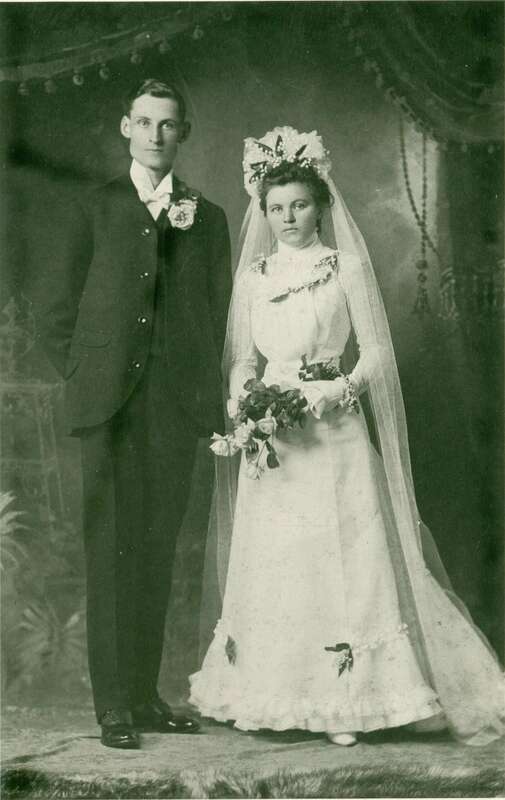 Here’s a photo of John Stark on the occasion of his marriage in 1900. He would have been a first cousin to Gust Rudeen, my great-grandfather. I have never heard of the Stark family before. Clearly Uncle Carl maintained contact with them; I don’t know if Gust would have known of them or not. As I was exchanging information with my DNA match, it turns out she lives on the north side of Denver and is a fellow member of the Swedish Genealogical Society of Colorado. What a small world! I look forward to connecting with her in person at a future meeting. Will be exciting as this story continues!!! I’m sure it’s been mentioned before, but how did Rudeen get chosen as the surname in the US? Hi Greg, we don’t know for sure, other than the usual explanation – too many Johnsons! That is really cool!! Can’t wait to hear more!